Your kidneys process about 200 gallons of blood each day to filter about 2 qt. of waste products and unnecessary fluid out of your body. Healthy kidneys help keep your blood clean and provide hormones that keep your body running efficiently. Excess body fat can adversely affect the health of your kidneys while some dietary fat may be beneficial. Your blood flows through the two bean-shaped organs, located just below your ribcage in the middle of your back, where tiny nephrons separate waste products from the normal proteins and cells your blood needs. Waste products are sent to the urinary tract for excretion. Additionally, your kidneys manufacture important hormones that regulate blood pressure, help produce red blood cells and assist with maintaining the chemical balance in your body. Your adrenal glands are located atop each of your kidneys. Each kidney and gland is surrounded by a capsule of adipose tissue, or fat, to help protect it from external force and to help prevent it from moving around in your abdominal cavity. According to research conducted in 2010 and reported in the "Oxford Journals," the more fat you have around your kidneys, the greater your chances of developing kidney disease, especially if you have type-2 diabetes. Eating a diet high in fat can adversely affect your kidneys by causing you to gain weight. Because obesity can contribute to the development of diabetes, most doctors do not recommend a high-fat diet. However, a 2011 study funded by the Juvenile Diabetes Foundation International found that a ketogenic diet, one that is high in fat, may reverse diabetes-induced kidney diseases. Rats fed a diet consisting of 5 percent carbohydrates, 8 percent protein and 87 percent fat showed improvement in kidney function. Check with a medical professional before attempting to prevent, diagnose or treat kidney disease. 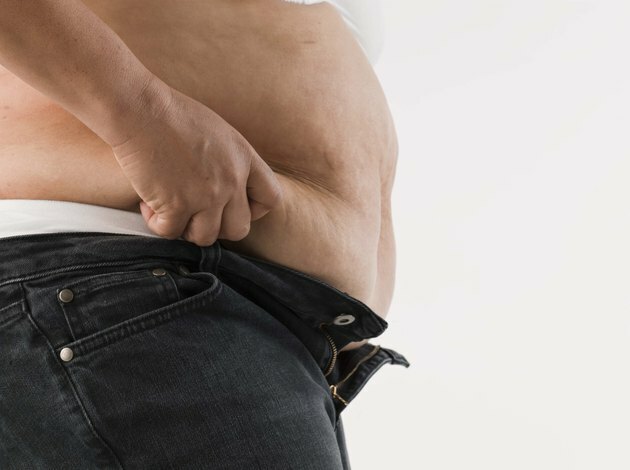 Excess body fat directly contributes to your risk of developing diabetes and high blood pressure, the main causes of chronic kidney disease. According to the National Kidney and Urologic Diseases Information Clearinghouse, diabetes contributes to the buildup of glucose in your blood, which acts as a poison, damaging the nephrons in the kidneys. High blood pressure can damage the small blood vessels of your kidneys, preventing them from being able to effectively filter waste from your blood. Because obesity is a risk factor for high blood pressure, excess body weight can negatively affect the efficiency of your kidneys.